These chicks are quite rare and I think this is the first post I have ever done about Nightjars. Nightjars are on the Amber list for conservation meaning that they are the next most threatened group behind the Red’s population wise. 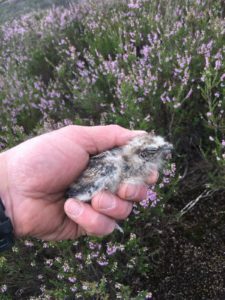 The Nightjars arrive back in the UK between late April to mid-May and they are best looked and listened for at dusk on warm, still, summer evenings and they will then generally leave again in August. Nightjars are nocturnal birds and can be seen hawking for food at dusk and dawn. With pointed wings and a long tail their shape is similar to a kestrel or cuckoo and their cryptic, grey-brown, mottled, streaked and barred plumage provides ideal camouflage in the daytime. They have an almost supernatural reputation with their silent flight and their mythical ability to steal milk from goats. The first indication that a nightjar is near is usually the male’s churring song, rising and falling with a ventriloquial quality. 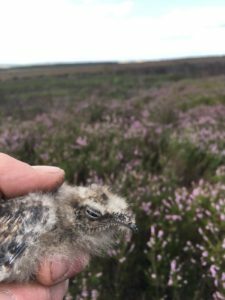 The North York Moors has an abundance of wildlife and bird species, and these Nightjars are just one species that often goes unnoticed.